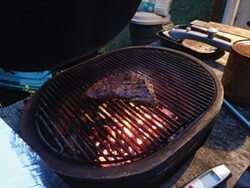 Under the dome: direct heat for grilling tri-tip. Two years with my kamado grill and I'm still in love. For those not familiar with the kamado style grill, it's usually ceramic and shaped like a big egg standing on end. In fact, the leading brand is aptly named "The Big Green Egg." I opted for an oval Primo model, which gives me more grill space and is manufactured in the United States. I use it weekly and have cooked three turkeys, innumerable chickens, racks of ribs, a prime rib roast, steaks, pork roasts, Cornish game hens and tri-tips. When I do my part it turns out some of the best barbecue ever. Kamado grills are a melding of a traditional Japanese design and modern high-fired ceramic technology. Fueled by lump charcoal, the heavy ceramic (mine weighs about a 100 pounds) provides a stable and uniform temperature throughout the cooking surface. You control the temperature inside by regulating the amount of air supply with inlet and exhaust vent positions. Since it is so well insulated, once at temperature there is very little air going through it. Smoke and steam are recycled within the dome making it a very effective smoker and ensuring your food stays moist even when well done. Since the magic happens when the lid is closed, my motto is, "If you're lookin' it ain't cookin.'" So, a remote sensing thermometer is useful. Just insert the probe into your food and read the temperature on an external screen. It takes about 15 minutes from lighting a charge of charcoal to get up to 350F, where I do a lot of my cooking. I cook whole chickens at 350F, taking them out when deep breast meat temperature reaches 160F and allowing the bird to rest for at least 10 minutes. My resting process is pretty simple: Lay out a large piece of aluminum foil, set the bird directly on it, wrap it up completely, then wrap in several layers of clean towels. (In my house, this is the last stop old towels make before recycling.) The bird will continue to cook and moisture that's pushed away from the hot surface by the cooking process will be allowed to migrate back in, making the bird juicy throughout. Recently, I cooked a tri-tip noting those little things I do without thinking about them. When I cook beef I aim for medium rare — juicy with maximum umami. While there are dozens of commercial "rubs" on the market, I prefer to work with basic ingredients. This entire process takes less than an hour and a half but probably about 15 minutes of actual hands-on time. This recipe is not fussy and always comes out well. I'm spoiled now — I almost never order beef in a restaurant. A few notes: No petroleum products should ever be used since they can absorb into the ceramic and give an off taste to your food. Avoid starters that are basically sawdust saturated with paraffin, which is also petroleum derived. 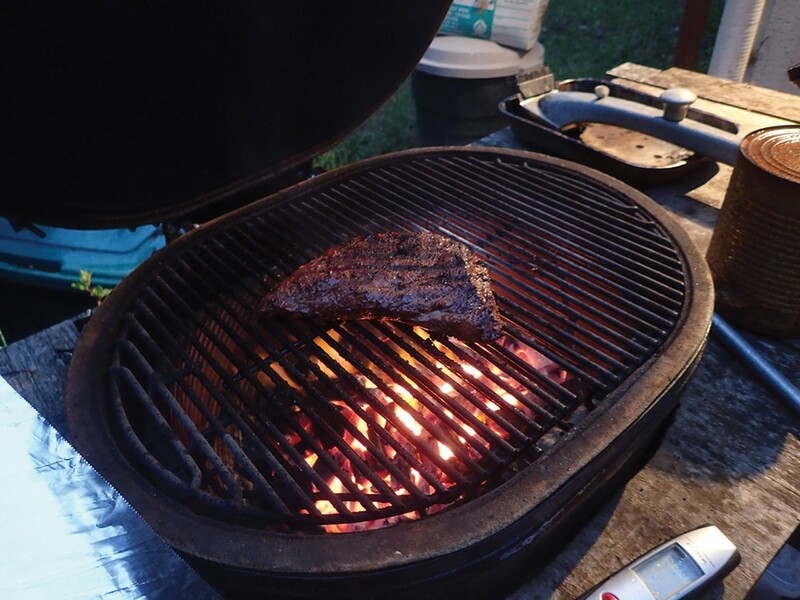 Kamado manufacturers also advise against using briquettes as they contain more ash and don't burn as hot or cleanly as good quality lump charcoal. When setting up, you'll want a sturdy stable place to set your grill, as kamados are heavy and, with the lid open, not always too stable. Rubbing oil on the meat helps the rub stick to the surface and carries the spice flavors into the meat. Sesame oil has a very desirable flavor but it's strong, so I use olive oil to dilute it. When you unwrap and slice the meat keep the juice. It's the best au jus ever. I cook a little on the rare side so reheated leftovers are great. First, put the tri-tip in a plastic bag with enough tamari sauce to wet all sides and let it marinate for a few hours or overnight. When you're ready to start cooking, remove the meat from the bag, pat it down and rub it all over with the mix of olive oil and toasted sesame oil. Mix the salt, onion flakes and spices in a bowl. Heavily dust the meat with it, until you can't see the surface of the meat. Save any unused rub for next time. Finally, pat the powders to assure they stick to the meat. Cover and set aside while you start the charcoal. There are as many different techniques to lighting your grill as there are cooks. 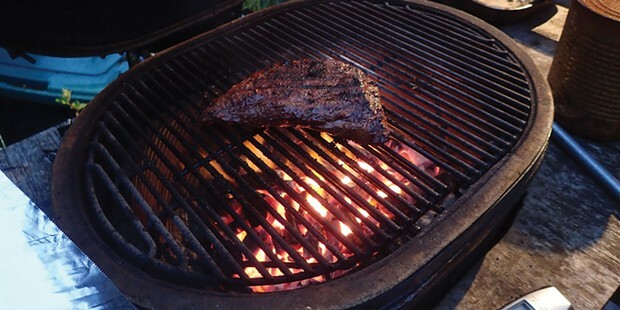 I use a propane torch and light several spots in the mound of charcoal. Once it's lit, configure my barbecue for indirect cooking by putting a ceramic plate on a rack between the meat and the coals. Some kamado manufacturers include these in the purchase price, others sell them as accessories. Set the vents to reach about 235F and wait for the temperature to stabilize. It takes a bit of fussing until you're used to it. Eventually, you get a feel for it — that's part of the fun. Just before putting the meat on, throw a handful of hardwood chips over the coals. I am fond of either hickory if I want a strong smokiness, or cherry if I am in the mood for a lighter flavor. Place the meat on the grill, insert the temperature probe into the center of the thickest part and sit back until the internal temperature is near where you want it (125F for rare, 135F medium rare). Once it reaches the desired temperature, remove the meat from the grill, wrap it in foil, then cover it in a couple of layers of old towels. Remove the ceramic plate and open up the vents wide. In a few minutes, when the temperature reaches 650F to 700F, put the meat back on the grill to get those pretty dark brown char and grill marks. It only takes a few minutes on each side, so watch it carefully. Re-wrap the meat and let it rest for 10 to 15 minutes before unwrapping. Cut thin slices across the grain, and enjoy.